The original Chiswick Park was part of the Duke of Devonshire’s Chiswick House estate and lay well to the south, in what is now Grove Park. This area was the farmland where Thomas Kemp Welch, inspired by the success of Bedford Park, tried in vain to create a garden suburb called Chiswick Park in the 1880s. Staveley Road now covers the site of Chiswick Park Farm. For reasons best known to itself, the Metropolitan District Railway Company renamed Acton Green station Acton Green & Chiswick Park in 1887 and it became plain Chiswick Park in 1910. The most likely explan­ation is that the Chiswick name carried a greater cachet than Acton’s, as it still does. Good quality terraced houses for the working classes began clustering around the station from its inception, in the area still more properly known as Acton Green. The London General Omnibus Company built its maintenance and engin­eering works opposite Gunnersbury station in 1921 and the facility employed 3,500 staff at its peak. Maintenance work trans­ferred to Elstree in 1956 and London Transport closed its engin­eering operation here in 1988, leaving the 30-acre site available for redevel­opment as a different kind of Chiswick Park. The Anglo-Norwegian Kvaerner Group has constructed twelve office buildings, which will ultimately accom­modate around 12,000 people in what is said to be the largest such project in London since Canary Wharf, although Paddington Waterside can also lay claim to this distinction. The business park’s tenant profile is mixed but is aimed primarily at the high-tech and new media sectors, including several TV broad­casters. The landscaping provides an ‘inner garden’, said to make reference to both Monet’s paintings and to Chinese influ­ences of the 19th century, while the ‘outer landscape’ is a simpler and more functional design that includes peripheral car parking and arterial corridors between the buildings. 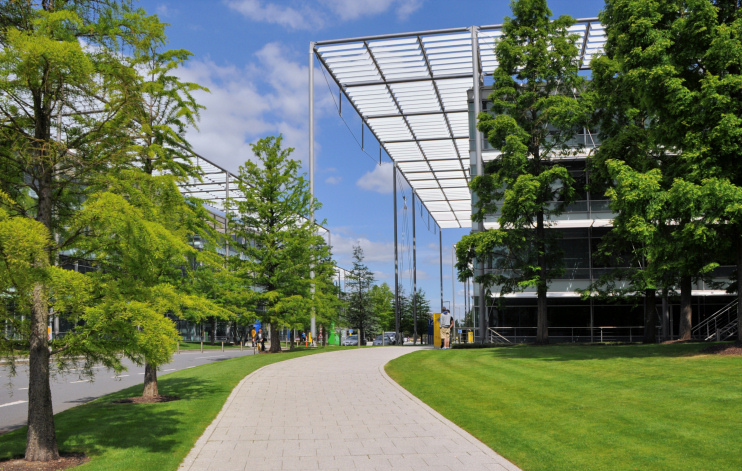 * The picture of Chiswick Park on this page is adapted from an original photograph (though it looks almost as though it’s a CGI illusion), copyright Lewis Clarke, at Geograph Britain and Ireland, made available under the Attribution-ShareAlike 2.0 Generic Licence. Any subsequent reuse is hereby freely permitted under the terms of that licence.